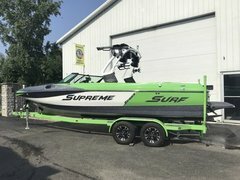 We just took delivery of our new S238 last weekend. When I set up the bimini, I noticed it was loose and hung low. If I lifted it up by hand, it probably made it to 6' 8" in height. If I let go, it settled around 6' tall. This caused me to hit my head a few times. When I got off the water, all I could see were four hex screws on both sides, which appeared tight. Is there something I'm missing that will keep the bimini at full height?